Until I dreamed about her last night. I found them in an old, battered brown suitcase. Nobody knew she was going to die although she was ninety-two. Grandmother was a secretive woman. She recognised her slacks though, and laughed to see me wearing them. that’s when she introduced me to my cousin Maria. and a migrant to Australia. Maria was married twice in Russia. The first time very young and for five years. “This husband liked entertainment too much”. Second time, to Sergio, for twelve years. We sit together watching the lights beam down. There are documents I can’t read, written in Cyrillic. March has long gone and here I am finishing off the travel blog at last. Disembarking from the ship was fraught. As I came through the turnstile my identity card was refused! Bells rang and security stepped forward. I was sent (like a naughty schoolchild) to what we used to call the Pursers Office but on VoS is known as Guest Services. The security officer phoned Guest Services and I was told that there was ‘a message’. Of course, all sorts of calamities rushed through my mind. Leaving Roland to carry on down to the terminal, I had to rush up to Deck 5 (from Deck 4) and wait in the queue until there was a spot. The young Chinese officer swiped my card and asked me if I was me. Naturally, I replied, “Yes” at which point she told me I was free to go! I asked her what was the problem? She replied, “A message!” End of conversation. No apology, no explanation. I have to say, I don’t think I will ever travel on Royal Caribbean again. Apart from this episode, sometime on the ship (or in Singapore) my credit card was skimmed. There were more than 3,000 passengers leaving the ship at Singapore and I now had to find Roland! He was still waiting on the deck but I was sent to the terminal via another gate. Luckily I saw him standing there looking so forlorn. I waved and shouted until he spotted me and came tearing down the gangway. It only took about 5 minutes to clear Customs but then we (and 3,000 others) had to wait for our transport to the hotel. Eventually I remembered to look at our itinerary and found the name of the man waiting for us (Mr Hoon). Our car to the Swissotel Merchant Court was a very smart Mercedes and our driver was Josef. There was another long wait to check in at the hotel and then, success! We were given an upgrade to an executive suite with free WiFi and a few other perks. Breakfast was included but for other meals we ate at one of the many food-halls. Singapore is amazing. We went for a walk to China Town. My goodness, it was like being inside a washing machine on spin cycle. Mind you, everything clean and tidy as expected. 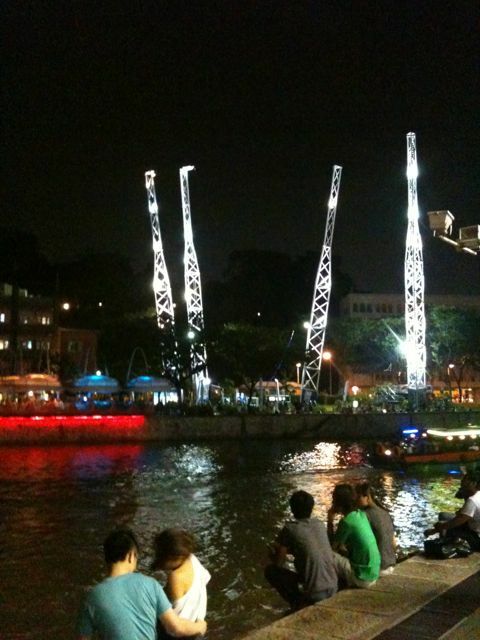 We took time to go on a Singapore River cruise. This turned out to be a great way to see many of the sights that we may otherwise have missed. 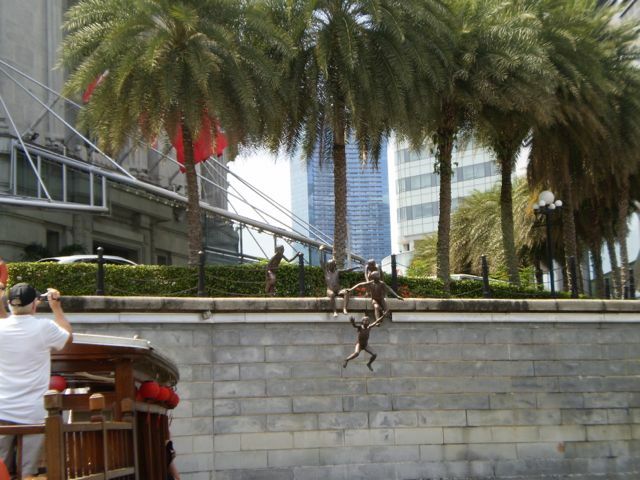 I was particularly taken with some of the sculptures along the banks of the river such as the one pictured here. On our visit to the Botanic Gardens we saw some other whimsical sculptures, often slightly hidden so you come upon them unexpectedly. The Orchid Garden in the Botanical Gardens were splendid. I am not a big fan of orchids but the colours and variety in the Gardens nearly converted me (but not quite). There was one area where the orchids were backed by mirror walls thus intensifying the display. Market! We didn’t go in but it was a funny (peculiar) place to find in Singapore. 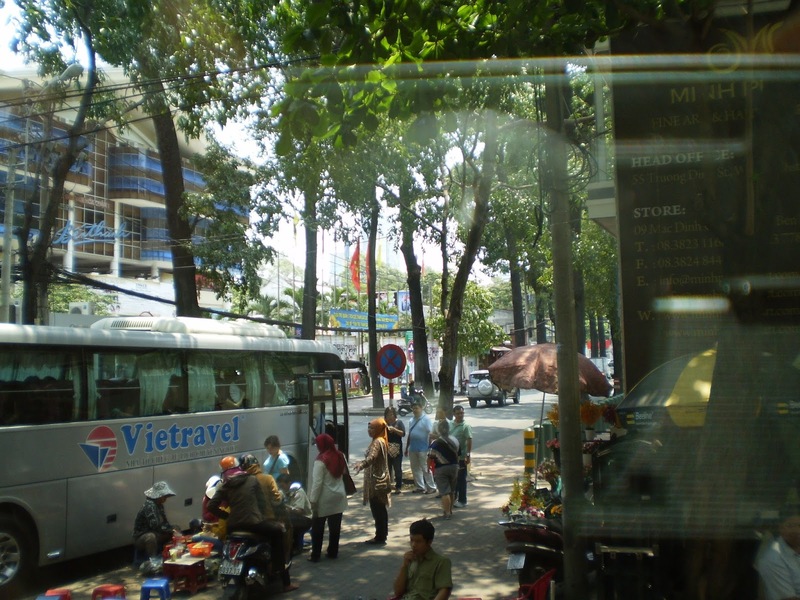 I was impressed by the sunshades over many of the Malls – also acting as umbrellas. Singapore is almost on the Equator and it rains a lot; maybe every day. There were storms when we were there but nobody seemed to miss a beat. 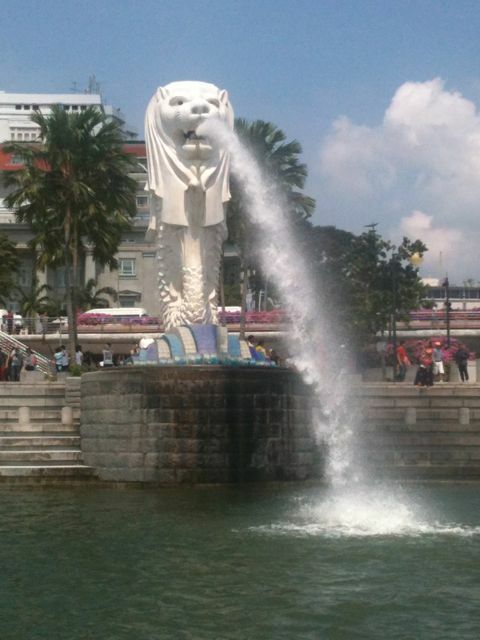 There is so much to see in Singapore, it is quite overwhelming. 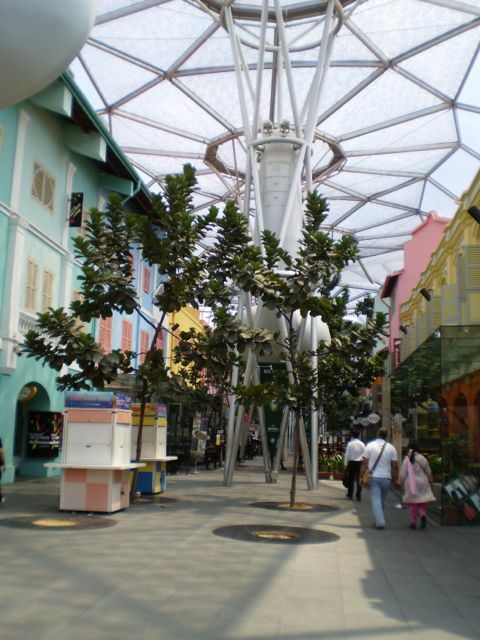 I would like to have visited the Lotus shaped Arts Science Museum, the Cultural Centre that looks like a hedgehog and the Singapore Flyer (you can just see it to the left of the Arts Science Museum below). Apparently it takes 45 minutes to go all the way round and the views are spectacular. Next time … Another place I will visit next time are the Gardens on the Bay. Two days in Singapore are not enough. We visited Little India and I wished I had been able to sample some of the delicious looking foods available. It was at this point that the heavens opened and we had to hurry back to the bus. When walking in Singapore I was able to get a sense of the history. There is so much development happening that the historical aspects tend to fade into the background. Next time (and there will be a next time …) I will visit the famous Raffles Hotel and have gin-sling. 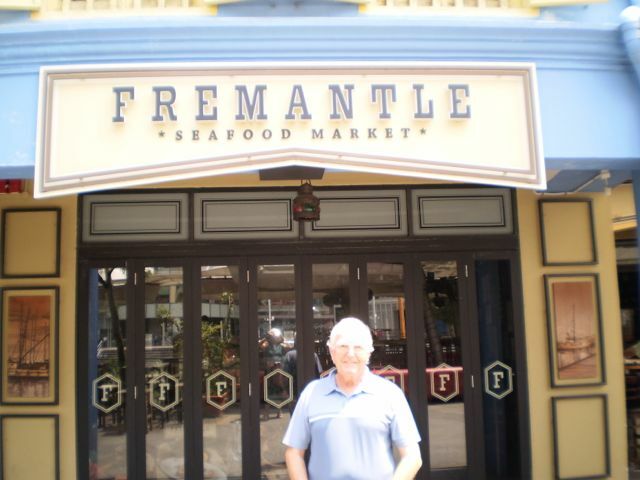 The time went far too quickly and after an extremely early start and an exceedingly revolting coffee at Changi Airport, we were on the plane home to Perth. On the way home at last! I think I must be a bit like a horse, I can hardly wait to get home again.